We had great luck with bears in our short time in & around the parks. 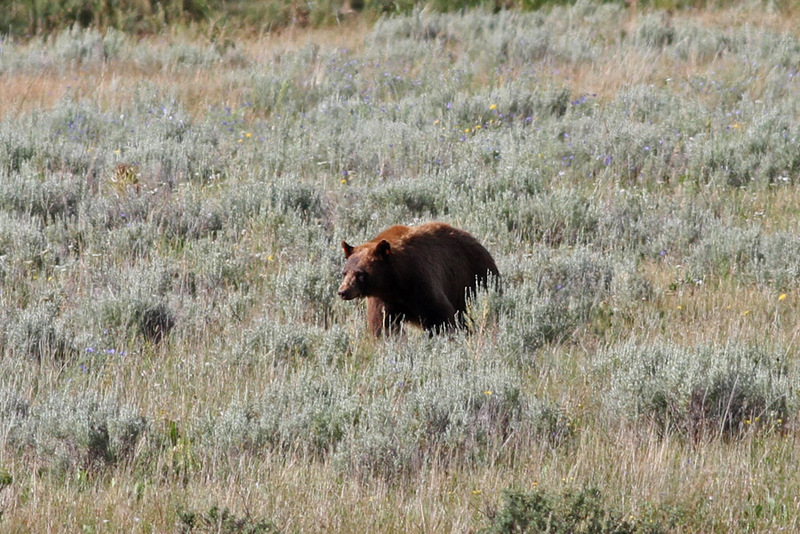 We started off strong with a BLACK BEAR at the base of the Signal Mountain trail in Grand Teton NP. We ended up with a total of 8 Black Bears on the trip, including a whopping five in one day! Partial credit to expert bear magnet/spotter Carolyn. 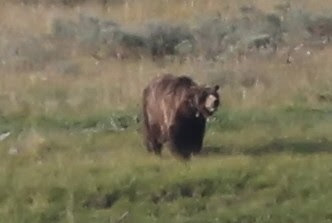 This hefty brown-colored bear was observed from the road near the WY/MT state line. Our first thought, naturally, was Grizzly Bear. 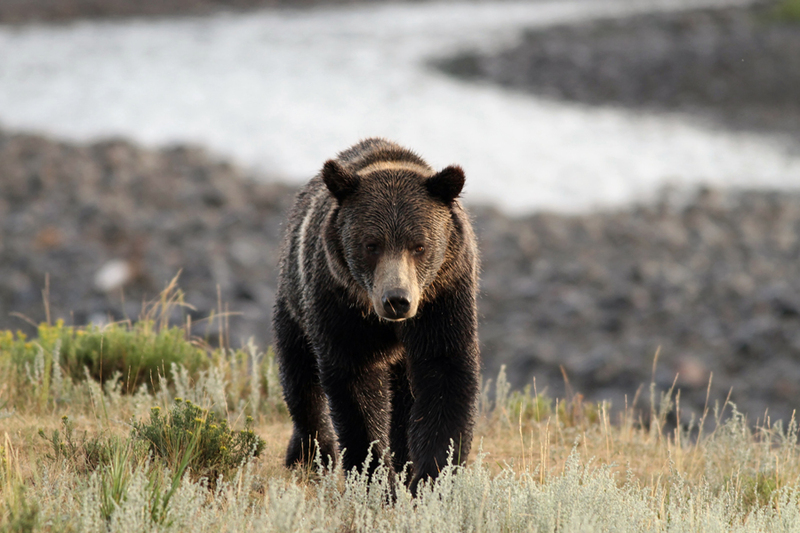 In fact, many folks pulled over for a look, thrilled that they had seen a mighty Grizz in the wild, and continued on their way. However once we took a closer look, we became far less sure. 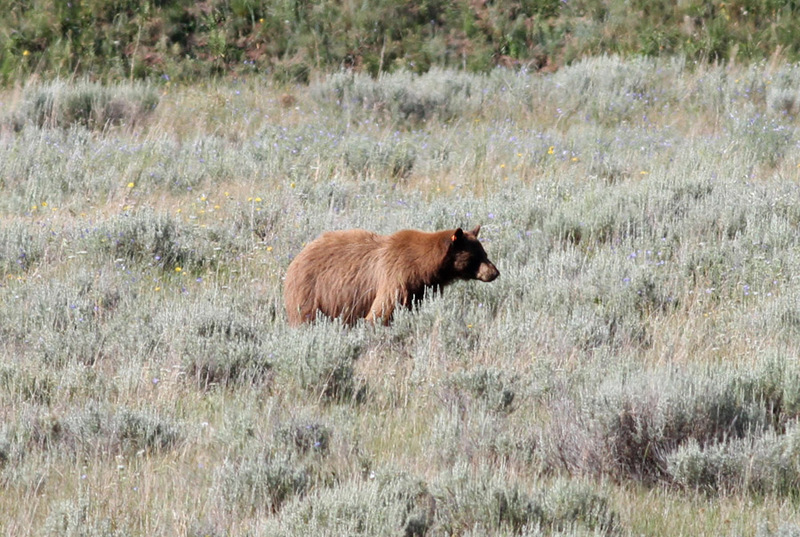 By the time we left the bear, we decided to run it by a few locals including a park ranger. Carolyn was leaning towards a cinnamon-phase Black Bear...she was right. Neither of us had previously appreciated just how light brown these western "Black" Bears can be. Of course, you know you're a birder when you start wondering about hybrids (hey, hybrid Brown x Polar Bear has been documented!). So we would have to wait for our life Grizzly after all. We were still thrilled that we a) got to see such an interesting Black Bear, and b) had the wherewithal to question the identification as neither of us are exactly bear experts. 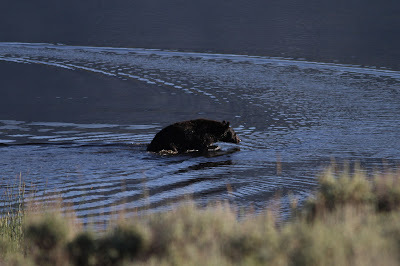 A couple mornings later we found ourselves in the Lamar Valley in search of Grizzly and Gray Wolf. We dipped (again) on the wolves but were eternally grateful when a group of tourists pulled over and spotted a distant dark speck on a mountainside across the valley. 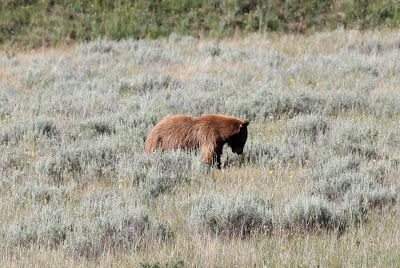 Scope views revealed it to be a GRIZZLY BEAR with two playful cubs in tow! Unfortunately (for you) the bears were a bit too distant for photography and weren't in view for too long anyway. On our final evening before driving back to Salt Lake to catch our flight, we decided to stick around Yellowstone on a last-ditch effort to see wolves, this time in the Hayden Valley. 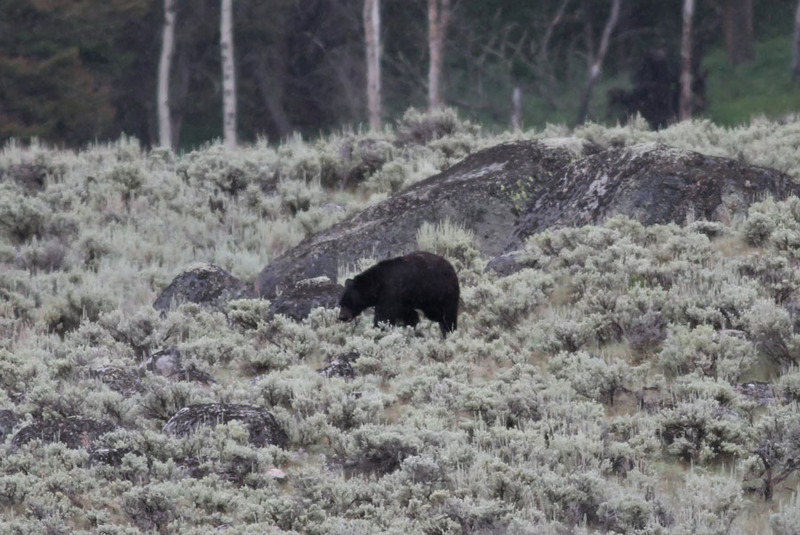 While scanning for wolves Carolyn excitedly called me over to the scope to look at the massive Grizzly Bear she had just spotted. 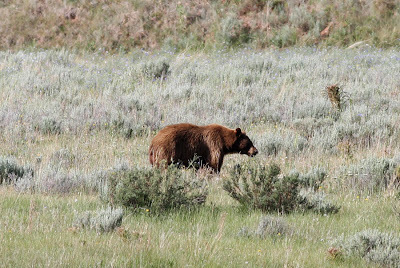 This big fella, identified as a 23-year old bear nicknamed Scarface by the locals, was also a very safe distance away. He stayed in the open for several minutes, allowing many people to enjoy his afternoon walk and swim. 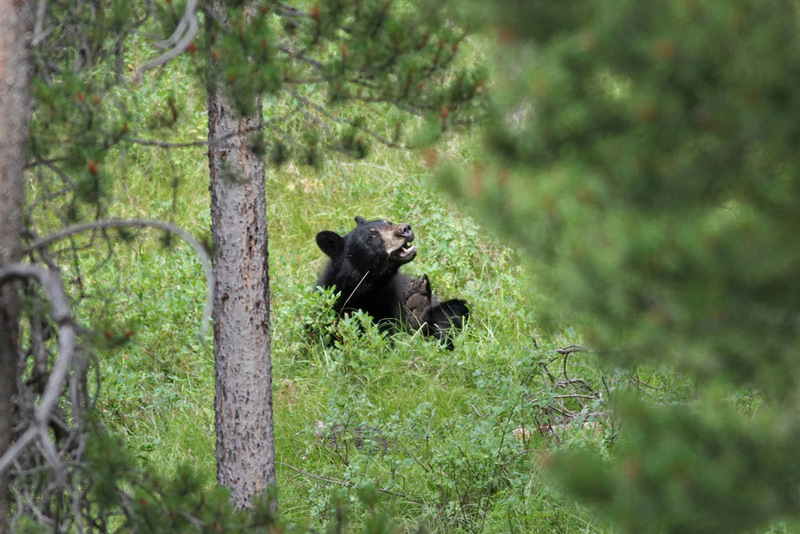 Original capture through a 400mm lens, to give an idea just how far away he was. Hey Boo-boo! Let's go get us a pic-a-nic basket! 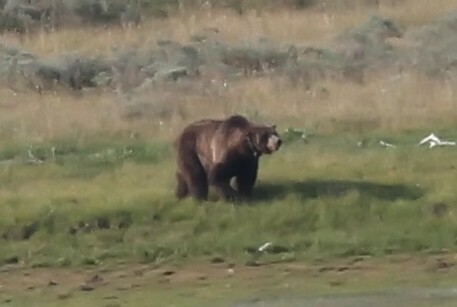 Now THAT is a Grizzly Bear. 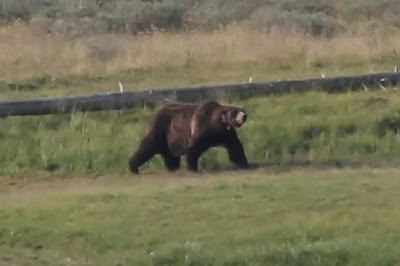 Note the exaggerated shoulder hump and different facial expression of the Grizzly versus the cinnamon Black Bear above. That's 8 Black and 4 Grizzly, not too shabby! Looks like a collar(tracking)around its neck.